1. Everyone gets on MySpace as part of a technology seminar and finds Star Woman working a webcam. 2. Dr. Klein brings in a Wii and Star Woman sees everyone battling demons and the like. 4. Tangerine comes to Valhalla and wants to kill Dr. Rocket. The other SuperFogeys have to step up to save him. Then, Tangerine does kill Dr. Rocket and he’s revealed as a robot double. Dr. Klein then moves to get the real Dr. Rocket into Valhalla by enlisting the help of the Society of Heroes. 6. The younger versions of the SuperFogeys time travel to the future to meet their older counterparts. Except a time-travel accident occurs and instead of a younger Swifty, an OLDER Swifty comes through and the older one is far more venomous and incorrigible. 7. A sidekick youth group comes to visit the SuperFogeys and do some caroling. They’re brats. 8. Swifty hooks up with Star Woman. Why? Because she’s the only one who thinks he’s funny. 9. Something with Swifty–but what? 10. Bingo night and CS wins! Gets time with a healer and can walk again but decides to stay in a wheelchair anyway because it’s easier. Now, let’s talk about this thing. What do you notice? Well, for one thing, Star Woman. Obviously, she turned into Star Maiden later on. Also, there’s no order to any of it. Faithful readers will recognize the plotlines and moments from the first nine chapters of SuperFogeys, but the throughline isn’t there yet and the last idea was actually the first one used, in Chapter Two – Bingo Night. This was me just brainstorming. 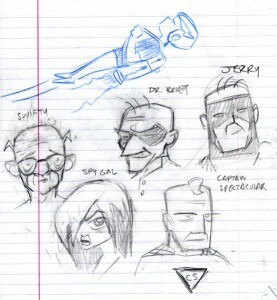 Just taking the concept of superheroes and marrying it to a nursing home and seeing what I came up with. As you can see, some big ideas were right there from the start. Jerry as Dr. Klein a cool idea, though I had no idea yet how, logistically, that would work–or even why. Not all of the ideas were good. Number 7 never happened. Number 9…I’m not sure what I was thinking there. I don’t think I even knew at the time. Maybe I had an idea and then lost it. Doesn’t matter. I moved on. I wrote the ideas down as they came to me, abandoned them when they didn’t. What’s important is that I got the ideas down. How did it all fit together? What, thematically, was I trying to say? That all came next. I guess, with your food analogy, you’re getting all the ingredients together in one pot to see what you can cook up? That’s a great way of putting it. Gotta bring stuff down off the shelf to see what I’m working with. Unfettered brainstorming is always the best first step to creation, I think. Awesome. Ha ha, actually I’d love to see #7 someday. Maybe a Christmas special? But I bet that would have fit in way better back in the tone of chapter 1 or so than now, of course. By the way, those sketches are awesome. I see that Swifty is the only one you hadn’t got down quite right yet and there’s the beginning of Cap’s son right there with the jet pack. By the way, I always wondered why Cap’s son didn’t inherit any super powers? Cap’s powers just aren’t genetic, I guess, since they’re given to him by alien tampering. Oh, um, back on topic, I can’t believe the original sketches of the characters were so close or spot on to what you settled with. I sometimes have to sketch and doodle for hours or even days (or weeks, which is ridiculous) before I get something just right. Maybe I just suffer from artist’s block?